You’ve probably heard of the term ‘milestones’ – measurements to help monitor your child’s development. While these measurements are designed to give an estimate rather than an expectation, it’s a good idea for parents to know the various milestones and how you can encourage your child to reach each one. And this is exactly what Fisher-Price Play IQ is designed to do. 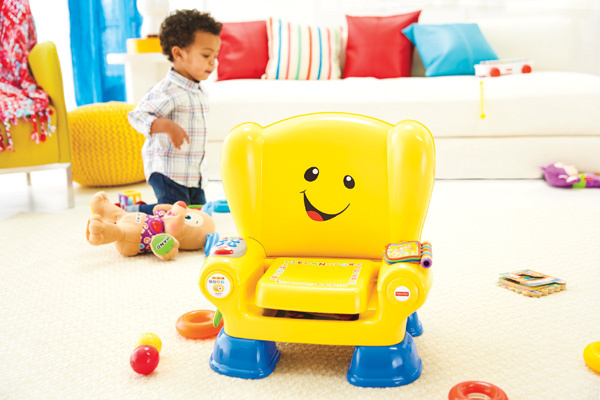 Fisher-Price Play IQ is an interactive website that offers an innovative way for parents to test their child’s Play IQ. Created by experts in child development, it tracks a child’s progress by finding the best toys based on their child’s age and developmental needs now as well as in the months and years to come. Stage a play date. Your child’s Social & Emotional Play IQ is the ability to share and express herself confidently while baby plays. Encourage your child to play with other children by attending or hosting a playgroup. You may need to sit on the floor and play with bub but having other children around will help develop confidence and willingness to interact with others. Incorporate role play. Pretend play mimics real life situations and can help develop your child’s confidence and activate imagination. Choose activities that baby is familiar with, such as pretending to do the dishes, to vacuum the floor, drive a car or to put baby to sleep. Choose toys that encourage interaction. Using the right toys and playing with other children will help your child learn the skills of sharing, listening and leading, as well as helping to prepare for pre-school. 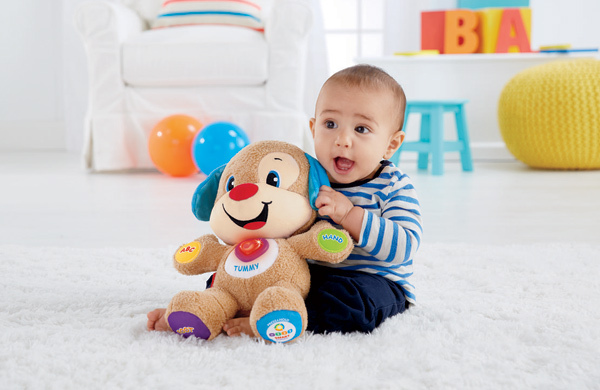 We love Fisher-Price Laugh & Learn Smart Stages Puppy as it interacts with your child through words and song. A good option for building confidence through pretend play is the Fisher-Price Little People Disney Princess Songs Palace which allows your little one to interact with a number of her favourite Disney princesses. Introduce toys that stimulate the mind. Cognitive Play IQ is about encouraging your child to touch, feel, listen and learn through play. Toys that inspire natural curiosity and love of learning help develop intelligence and creativity. 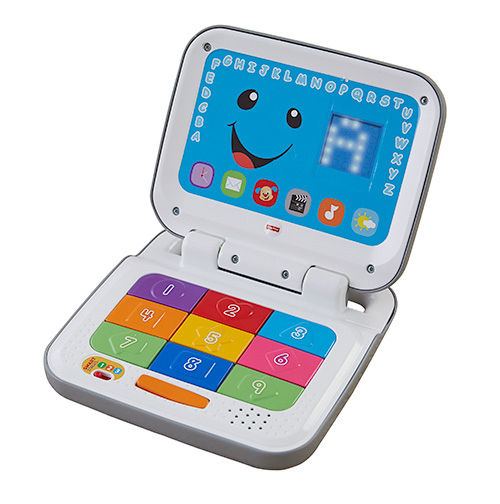 The Fisher-Price Laugh & Learn Smart Stages Laptop and Tablet are two of our top choices for unlocking the love of learning. There are plenty of other toys that encourage cognitive development, from stacking blocks to shape sorters. Get musical. Use a variety of household items such as pots, pans, wooden spoons and glasses to create your own orchestra . Clap, snap, sing and stomp out different sounds while your infant watches on. And dust off those nursery rhyme books from your primary school days – it’s time to revisit all the old classics. Test their colours. Help your toddler identify colours by placing a few containers amongst a pile of blocks. Start by adding a different coloured block to each container and encourage your child to do the same. Cruise the house. Learning how to reach, grab, get up, move, crawl, walk and run are all physical development milestones. As your child develops strength, coordination and confidence, Physical Play IQ grows. Create a safe and colourful play gym in your living room with stacked cushions, pillows and stools for your child to explore. Add a few favourite toys to each area for extra incentive to get up and ‘cruise’. Strengthen physical development through play. 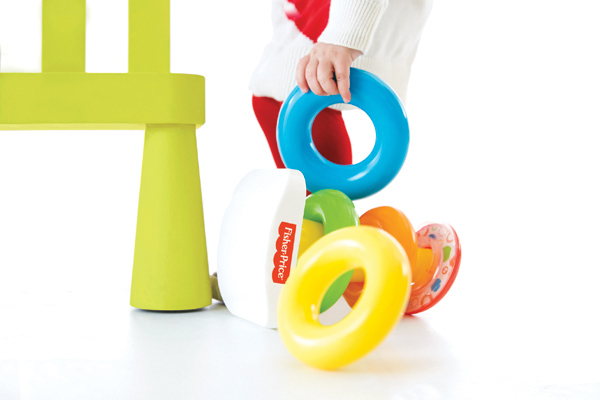 You can help build your baby’s confidence to explore by choosing toys that inspire movement. 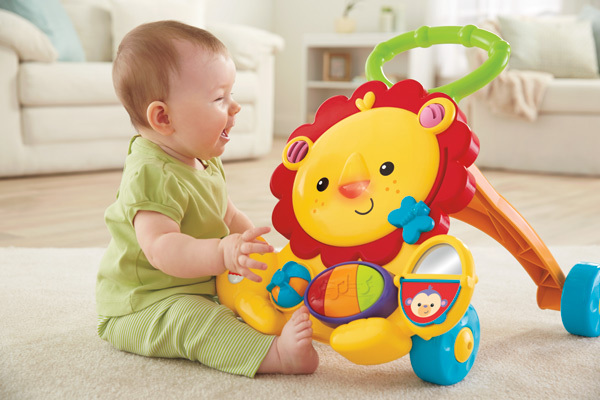 There are several toys that develop Physical Play IQ including the Fisher-Price Musical Lion Walker and the Activity Walker, both of which are designed to help infants go from cruising to their first steps with ease. Play follow the leader. This is a great one for babies and toddlers, regardless of whether they are crawling or running. Perform a variety of different physical movements based on their level and encourage your child to mimic you. Start with simple things like touching your head, putting your arms up, rolling over, marching and kicking your foot in the air. Play IQ comes down to play. After all, it’s how children learn about the world around them and experts agree that playing is a critical aspect of child development. 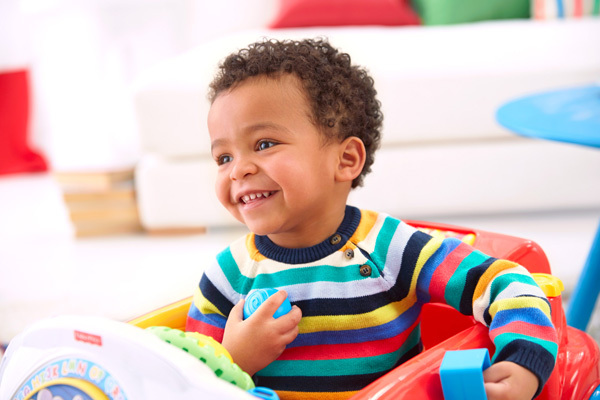 We encourage all parents to have a look at the Fisher-Price Play IQ website and test out the Fisher-Price Play IQ quiz to determine what type of learner your child is and where baby is on the milestone journey. Once you have a better understanding of the three development areas, you will be able to help your child reach each milestone with confidence.